Rory McIlroy was left to rue a costly error after crashing out of the WGC-Dell Technologies Match Play at the last-16 stage. Report from Tiger Woods' victory over Rory McIlroy at the WGC-Dell Technologies Match Play. McIlroy suffered a 2&1 defeat against Tiger Woods at Austin Country Club, where the Northern Irishman wasted a great opportunity to pull level with the 14-time major champion. The world No 4 was three behind with seven to play but reduced the deficit to one after back-to-back birdies from the 12th, before nailing a monster drive down the par-five 16th fairway. With Woods finding a fairway bunker and having to lay up on his way to finding the green in three, McIlroy inexplicably left his wedge way short of the putting surface and landed on a tough spot near the greenside bunker. 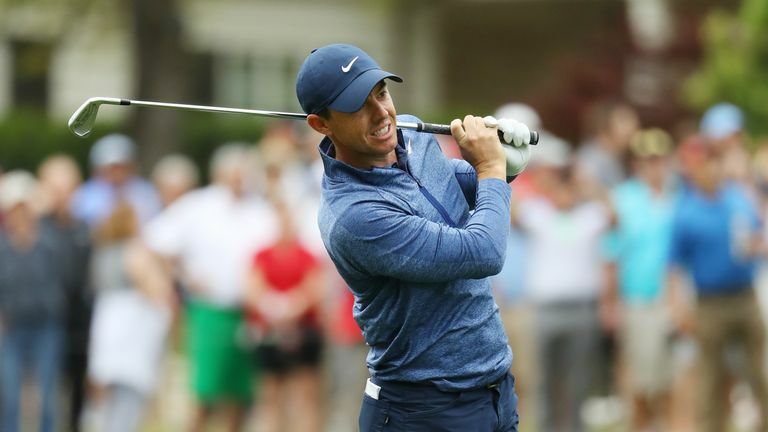 Worse was to come for McIlroy as he saw his third shot shoot across the green and roll up against a sleeper fence, forcing him to take an unplayable lie, before his fifth shot finished in the bunker. McIlroy almost holed-out from the sand but ended up conceding the hole to fall two behind with two to play, before Woods holed a 15-footer at the next to save par and complete his victory. Click on the video above to see McIlroy's costly hole! Who will win the WGC-Dell Technologies Match Play? Watch the final day live on Sunday from 3pm on Sky Sports Golf and 9pm on Sky Sports Main Event!